It remains unclear where these buildings were on the site, though documentary evidence provides some clues. In August 1872, The Queenslander newspaper reported on an indecent assault case against a Matthew Battersby, a blacksmith employed at the plantation. A good deal of evidence was given by some of the witnesses named as to the position of certain buildings and premises, including that workman’s cottages, which were stated to be from 160 to 200 yards distant from the main plantation house and kitchen (Unknown Author 1872). 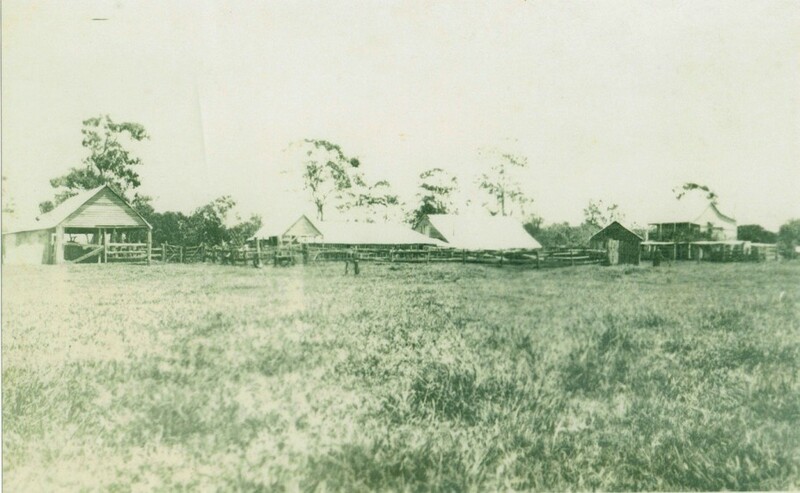 Cattle yards at Moray Fields c.1920, the Accomodation building os on the right hand side of the photograph. John Dunmore Lang (1868) Cotton and Sugar, The Great Staples of Queensland, The Brisbane Courier, 6 October 1868, p.2. Unknown Author (1872) Judicial Affairs, Supreme Court, Mon 26 August, Criminal Sittings, Indecent Assault, 31 August 1872, The Queenslander, p.3.